Heavenly Father, Your warrior prepares for battle. Today I claim victory over Satan by putting on the whole armor of God! I put on the girdle of truth! May I stand firm in the truth of Your Word so I will not be a victim of Satan’s lies. I put on the breastplate of righteousness! May it guard my heart from evil so I will remain pure and holy, protected under the blood of Jesus Christ. I put on the shoes of peace! May I stand firm in the Good News of the Gospel so Your peace will shine through me and be a light to all I encounter. I take the shield of faith! May I be ready for Satan’s fiery darts of doubt, denial, and deceit so I will not be vulnerable to spiritual defeat. I take the Sword of the Spirit! May the two-edged sword of Your Word be ready in my hands so I can expose the tempting words of Satan. By faith we warriors have put on the whole armor of God! We are prepared to live this day, this week in spiritual victory! In Jesus’ name, AMEN. 10 Finally, my brethren, be strong in the Lord and in the power of His might. 11 Put on the whole armor of God that you may be able to stand against the wiles of the devil. 12 For we do not wrestle against flesh and blood, but against principalities, against powers, against the rulers of the darkness of this age, against spiritual hosts of wickedness in the heavenly places. 13 Therefore take up the whole armor of God that you may be able to withstand in the evil day, and having done all, to stand. 14 Stand therefore, having girded your waist with truth, having put on the breastplate of righteousness, 15 and having shod your feet with the preparation of the gospel of peace; 16 above all, taking the shield of faith with which you will be able to quench all the fiery darts of the wicked one. 17 And take the helmet of salvation, and the sword of the Spirit, which is the word of God; 18 praying always with all prayer and supplication in the spirit, being watchful to this end with all perseverance and supplication for all the saints. The phrase “sword of the Spirit” is found only once in Scripture, in Ephesians 6:17. 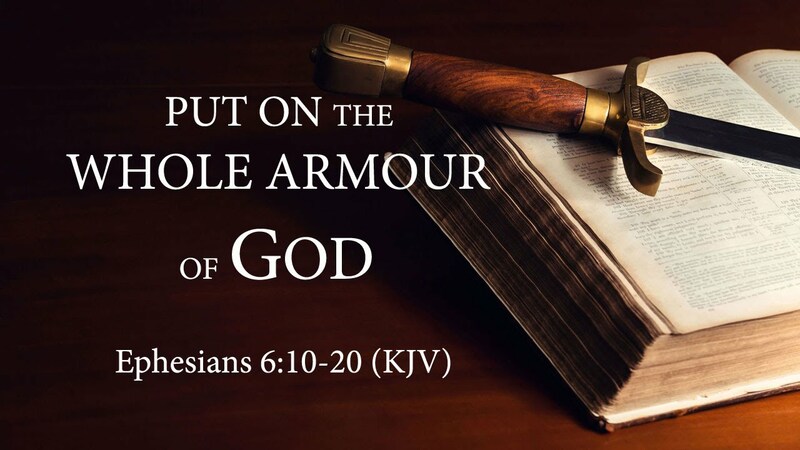 The sword is one of the pieces of spiritual armor Paul tells the Ephesian Christians to put on as part of the “full armor of God” that will enable us to stand our ground against evil (Ephesians 6:13). The sword is both an offensive and defensive weapon used by soldiers or warriors. In this case it is a weapon belonging to the Holy Spirit. Swords were used to protect oneself from harm or to attack the enemy to overcome or kill him. In both cases it was necessary for a soldier to get rigid training on the proper use of the sword to get maximum protection. All Christian soldiers need the same rigid training to know how to properly handle the Sword of the Spirit, “which is the word of God.” The sword that Paul refers to here is the Holy Scriptures. We know from 2 Timothy 3:16–17 that the word of God is from the Holy Spirit and written by men. Since every Christian is on the spiritual battle with the satanic and evil forces of this world, we need to know how to handle the Word properly. Only then will it be an effective defense against evil, but it will also be an offensive weapon we use to “demolish strongholds” of error and falsehood (2 Corinthians 10:4–5). God refers to His Word as a sword in Hebrews 4:12. Here the Word is described as living and active and sharper than a double-edged sword. The Roman sword was commonly made in this manner. The fact that it had two edges made it easier to penetrate, as well as to cut in every way. The idea is that of piercing, or penetrating; the Word of God reaches the “heart,” the very center of action, and lays open the motives and feelings of those it touches. The purpose of the sword of the Spirit—the Bible—is to make us strong and able to withstand the evil onslaughts of Satan, our enemy (Psalm 119:11, 33–40, 99–105). The Holy Spirit uses the power of the Word to save souls and then to give them spiritual strength to be mature soldiers for the Lord in fighting this corrupt and evil world we live in. The more we know and understand the Word of God, the more useful we will be in doing the will of God and the more effective we will be in standing against the enemy of our souls. Our strategy here is to know God’s Word as a devouring flame, a crushing hammer, a life-giving force, a saving power, a defensive weapon, and a probing instrument. Read these scriptures (Jeremiah 5:14, Jeremiah23:29, Ezekiel 37:7, Acts 19:20, Romans 1:16, Ephesians 6:17, Hebrews 4:12). God’s Word is a blessing to those who reverence it. Charge: When the enemy comes to you and tries to tempt you, draw your sword, say “It is Written”, and watch what God does. 1). Let’s read our study scripture (Ephesians 6:10-18). 2). Where do you keep your sword? 3). Pray this week’s prayer again. 4). Who tell the Ephesian Christians to put on this armor? 5). How many times does the phrase “sword of the spirit found in the Scripture? 6). The sword is both ___ and ___weapon used by __ or ___. 7). Read 2 Timothy 3:16-17, explain. 8). Read 2 Corinthians 10:4-5, explain. 9). Read Hebrews 4:12, explain. 10). What is the purpose of this weapon? 11). The Holy Spirit uses the __ of the __to save souls and then to give them ___ ___ to be ___ ____ for the Lord. 12). According to day 1 scripture, what is divinely inspired to you? 13). Read the Scriptures for “Precepts written in the heart, explain. 14). What is precepts written in the heart according to scritprue? 15). What furnishes a light in darkness? 16). Read day 3 scriptures and explain as you can. 17). Is love in the Bible a command? Explain. 18). Read day 4 scriptures, and share what you get out of them. 19). Explain day 5 strategy session. 21). Where is the location of this weapon?